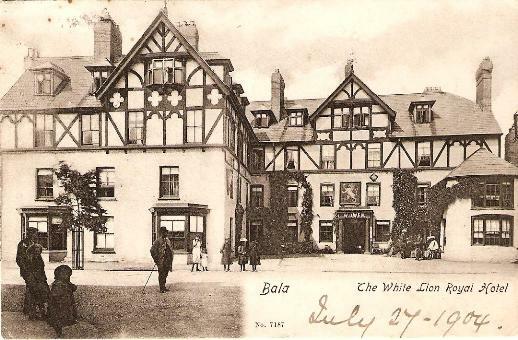 '...Bala, a small town in the parish of Llanyckil, noted for its vast trade in woolen stockings, and its great markets every Saturday morning, when from two to five hundred pounds worth are sold every day, according to the demand. Round the place, women and children are in full employ, knitting along the roads; and mixed with them Herculean figures appear, assisting their omphales in this effeminate employ. During winter the females, through love of society, often assemble at one another's houses to knit; sit round a fire, and listen to some old tale, or to some antient song, or the sound of a harp; and this is called Cymmorth Gwau, or the knitting assembly. 'MUCH of the wool is bought at the great fairs at Llanrwst, in Denbighshire. 'CLOSE to the south-east end of the town, is a great artificial mount, called Tommen y Bala, in the summer time usually covered in a picturesque manner with knitters, of both sexes, and all ages. From the summit is a fine view of Llyn-tegid, and the adjacent mountains. On the right appear the two Arennings, Vawr and Vach; beyond the farter end, soar the lofty Arans, with their two heads Aran Mowddwy and Penllyn; and beyond all, the great Cader Idris closes the view. 'THIS mount appears to have been Roman, and placed here, with a castelet on its summit, to secure the pass towards the sea, and keep our mountaineers in subjection. The Welsh, in after time, took advantage of this, as well as works of the same nature. 'THE town is of a very regular form: the principal street very spacious, and the lesser fall into it a right angles. I will not deny, but that its origin might have been Roman. 'THE mounts form a chain. I have observed one within sight of this, on the mountain road to Ruthin, which is called Tommen y Castell; Caer Crwyn is a finall entrenchment, not remote from it, overlooking the vale of Edeirnion; the mount in the valley of Rug is another; a third, much more considerable, lies within sight of this, on the road to Gwyddelwen; and furthe on, in the parish of Bettws, is a fourth, which goes under the usual name of Tommen y Castell. 'Bala takes its name from its vicinity to the place where a river discharges itself from a lake. Balloch in the Erse language signifies the same. I know little of its antient history, any more than it seems to have been dependent on the castle of Harlech; and that in the reign of Edward II. it was committed to the care of Finian de Stanedon, constable of that castle; and in the time of Edward III. his great general, Walter de Manni, was rewarded with the fee-farm of Bala and Harlech, and was made sheriff of this county for life. I may add incidentally, that Edward I. gave one Hugo de Turbervill liberty of hunting through Meirionithshire all kinds of wild beasts, while probably the subdued natives were only his Chasseurs.